Say hello to the one that started it all, the Dansko Professional clog. As with the entire Professional series, the Dansko Professional Watercolor Stripe proudly carries the Seal of Acceptance from the American Podiatric Medical Association. The canvas uppers feature a beautiful watercolor-like design. The padded anatomical footbed boasts some of the most excellent arch support in the business, and the roomy toe box allows ample room for freedom of movement for your toes. Don't forget about the signature rocker bottom platform which helps propel the foot forward as you walk, releasing stress on the knees and back. The generously padded instep collar allows for comfort around the top of your foot, and the protective polyethylene heel counter acts as a natural shoe horn while allowing your heel to move up and down as you walk. Dansko stapled clog outsoles are designed to be slip-resistant in workplace environments. SATRA, the world's leading research and technology organization for the footwear industry, has tested the shoes in environments where excesses of vegetable oils and animal fats are present. 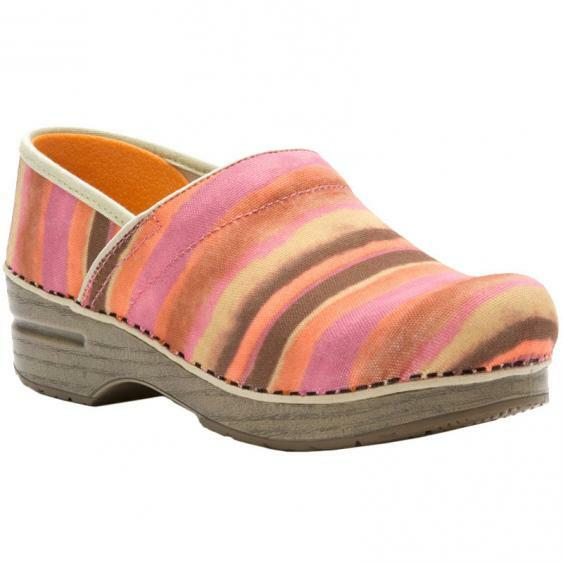 Fit tip: This clog should fit snugly at the instep, with room for toes to wiggle freely, and loosely in the back so that the heel moves up and down as you walk (a pinkie finger might fit between your heel and the shoe).